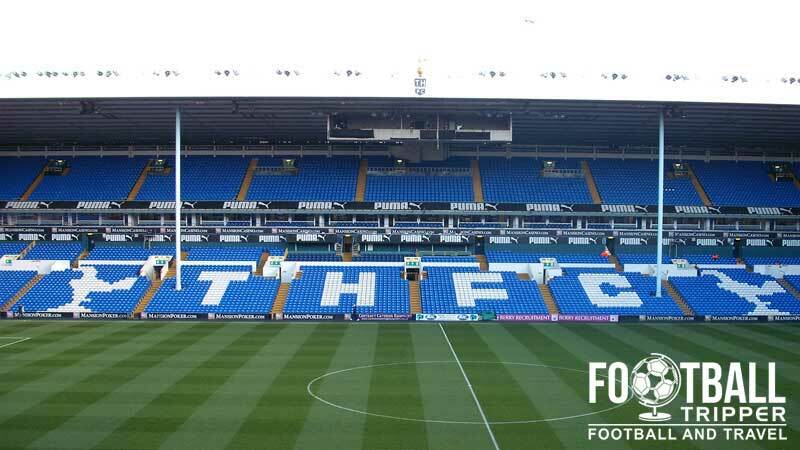 White Hart Lane in North London has been the home of Tottenham Hotspur Football club since 1898 and after undergoing numerous renovations to modernise facilitates it currently has a capacity of 36,240. Plans to move to a new stadium are currently in the works. The Lane first opened back in 1899 when a patch of land owned by Charringtons Brewery was renovated into a football pitch by local groundsman, John Over. Formed six years before, Spurs had previously played their matches on Tottenham Marshes but games were often abandoned due to the poor conditions including one match against early antagonists Royal Arsenal F.C. The first official match at White Hart Lane was held against Notts County which was watched by over 5,000 fans. 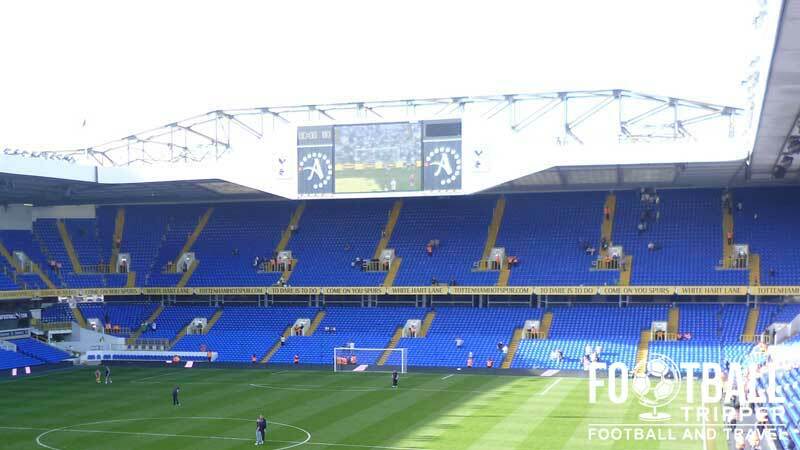 However by the 1930s attendances would rocket, making Spurs one of the biggest clubs in the country. The club’s record attendance of 75,038 was just before the war broke out in 1938 during an FA Cup match against Sunderland. Tottenham mostly developed their stadium towards the end of the 20th century with the current iteration of The Lane much different to Archibald Leitch’s original design. The West Stand was the first section to be rebuilt in the 1980s, followed by the north and south goal-end stands in the 1990s which are recognisable for their distinctive “Jumbotron” video screens. 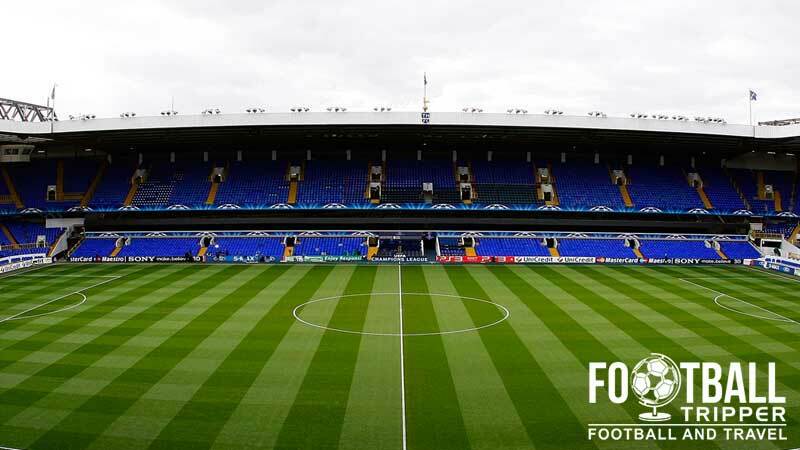 Since rivals Arsenal moved to The Emirates Spurs considered the future of the Lane, and have extensively explored their options including a potential move to the Olympic Stadium and more renovation work. However, Spurs are now planning to build their own new stadium after receiving the go ahead in Februrary 2015. Located nearby in the borough of Haringey, concepts have been drawn by KSS Design Group who were involved with the 1990s facelift of Stamford Bridge, and if all goes to plan it will open during the 2018/2019 season. 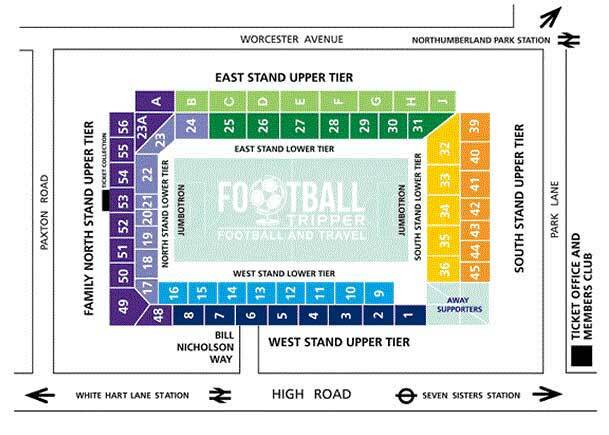 White Hart Lane is comprised of the following four sections: Paxton Road Stand (North), Worcester Avenue Stand (East), Park Lane Stand (South) and High Road Stand (West). Away fans who make the trip to White Hart Lane watch the game tucked into the corner between the South and the West Stands. The normal allocation of around 3,000 tickets encompasses both tiers of the stand unlike some grounds who confine some away supporters to either the upper or lower tier. Views from both tiers in the corner are completely fine with unrestricted views, as is the case for every other stand in Tottenham’s stadium excluding the East Stand which has two support columns. The seating arrangement of both the south and east stands feels quite steep which makes the pitch feel closer than it really is – not that leg room is much of an issue. The little corner is quite bright during daytime kick-offs courtesy of the translucent roofing panels towards the back of the stand, and the high-roof ensures that the acoustics travel well around the ground. The concourses and facilities are unremarkably fine, with the only slight issue being that some supporters may feel the two sets of fans are a little too close together. Although a number of pubs have closed down within the local area in recent years there’s still a fairly decent choice of boozers within 10-15 minutes of the ground which welcome both home and away supporters. On Pretoria Road in front White Hart Lane Station there is the Harringey Irish Club, and just off of Middlesex University campus there is the Three Compasses on Queen Street. Located on Lordship Lane there is The Elmhust which is recognisable by its Mock Tudor exterior. As you get closer to the ground there are 1-2 pubs which appear to clearly be partisan, with The Bricklayers describing itself as a “Bustling Tottenham Fans Local”, and the Bell & Hare south of the ground usually occupied solely by Spurs fans on matchdays. Behind the western stand is the A1010 High Road which connects the ground to White Hart Lane, and as a main road it is plentiful with takeaway choices. As they are largely independent there isn’t much point creating a big list but they range from sandwich bars to kebab shops, and failing this there is a decent sized Sainsbury’s on Northumberland Park five minutes away. Note: Bank holidays will invariably be closed and on Matchdays you can call 020 8365 5042 to find out the exact opening times. If you can’t make it to the store you can always shop online. Billed as a “Great day out in London for all the family” the tour lasts anywhere between 90 – 120 minutes and covers everything from the tunnel to the dug-outs, and the changing rooms to the boardroom, in addition to other usually off-limit areas of the ground. Tours run twice a day in the morning and afternoon, Monday to Fridays as well as more frequently at the weekend when there is no scheduled game. To book a tour either phone +44 (0) 844 844 0102 or visit the club’s website. Spurs divide their tickets into three pricing categories based on how popular demand is likely to be for each given game. The most expensive tickets are in West Upper and Lower, with North and South Lower always being the most affordable seats in the house. To book tickets check out the official site or phone 0844 844 0102. You can occasionally buy tickets at the stadium but matches are often sold out so it’s best to book in advance where possible. White Hart Lane is located in the Tottenham area in the north of London at just over 6 miles from the centre of the capital. Seven Sisters is regarded as the closest Tube Station to White Hart Lane. Unlike their North London Rivals, Arsenal, they do not have their own officially named tube station. If you are planning on driving to see Spurs then be advised that parking is a massive ball-ache and with the reliability of public transport in London being what it is, you’d probably be mad not to use it. If for any reason are still intent on driving keep you eyes peeled for the Controlled Parking Zone signs which extends a mile or so around the perimeter of the ground and only permit local residents and blue badge holders to park legally. Private Car-Parks are reportedly available within a few miles of the ground, however at the cost of around £15.00. As Tottenham is in London you’re going to want to use some form of train whether that’s the tube or overground service depends where abouts you’re travelling from. White Hart Lane train station is 20 minutes on the train from Liverpool Street Station. If you’re coming up from Victoria Station then you can catch a train to the stadium from Seven Sisters Tube station which is on the Victoria Line (Blue). The tube station is connected to the main station which is also called Seven Sisters and from here you can catch an overground service which will take you no more than 5 minutes. Spurs fans holding aloft flags of the club’s colours. I couldn’t imagine why you’d want to get a bus from Seven Sisters, however if need be anything ending in a 9 supposedly takes you to White Hart Lane: 149, 249, 279 or 349. There are no hotels in the area around the stadium. Booking a hotel near Liverpool Street Station would make for a short train journey, but this is not the cheapest area. With the excellent Underground system, don’t be afraid to travel a bit further out to the edges of Zone 2/3 if you want something more affordable.